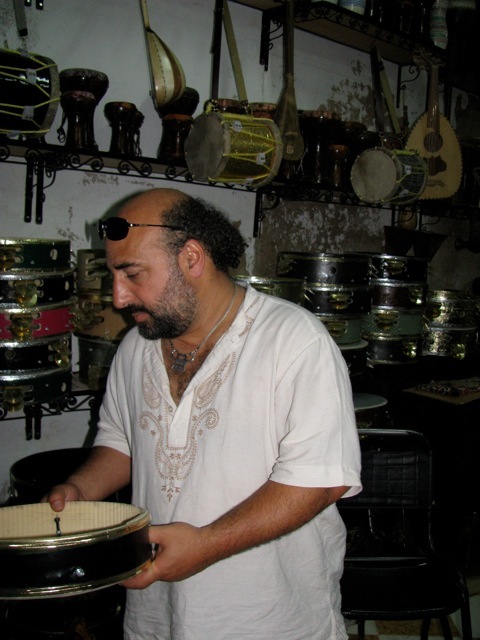 On day 10 of our tour to Morocco, we were touring Fes in smaller groups. 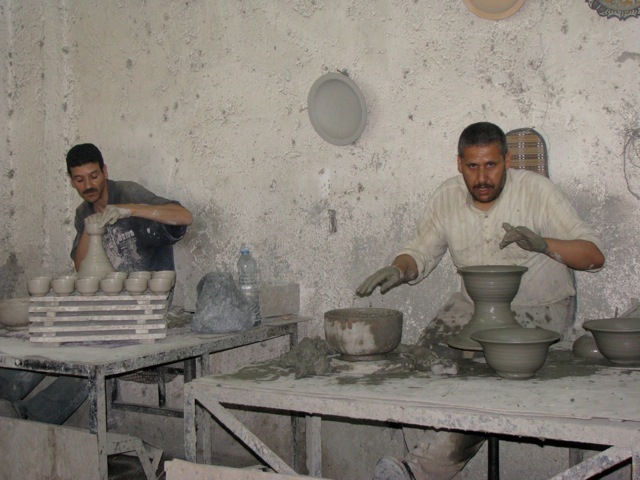 My group started the day touring a ceramics factory. 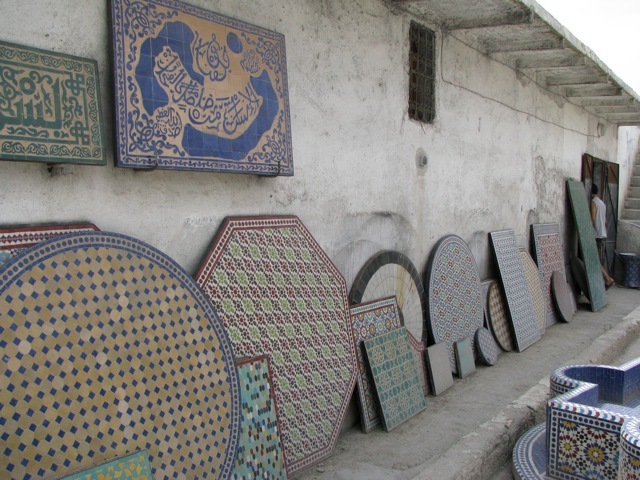 We got to see the entire process, from the manufacturing of the clay, the spinning of plates and bowls on foot-powered pottery-wheels, the cutting of stones for mosaics, the detailed hand-painting of the various pieces, and the wood-fired kilns. Of course, the tour ended with the opportunity to pay inflated prices for some of the beautiful factory-direct pieces they had created. 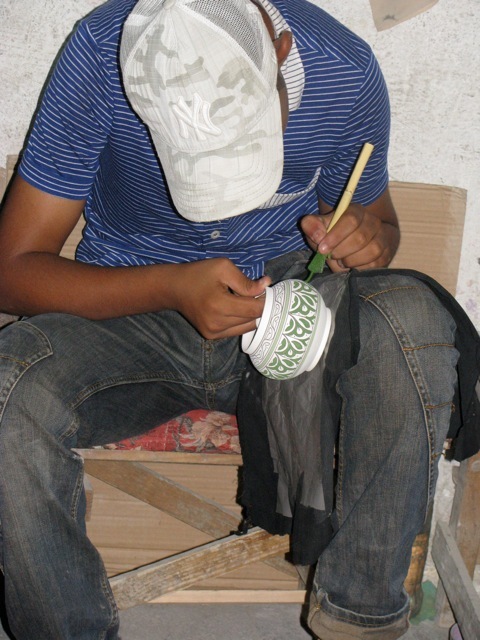 I passed on the opportunity, but actually found some nice hand-painted plates later that day when shopping in Fes (and for more reasonable prices as well). 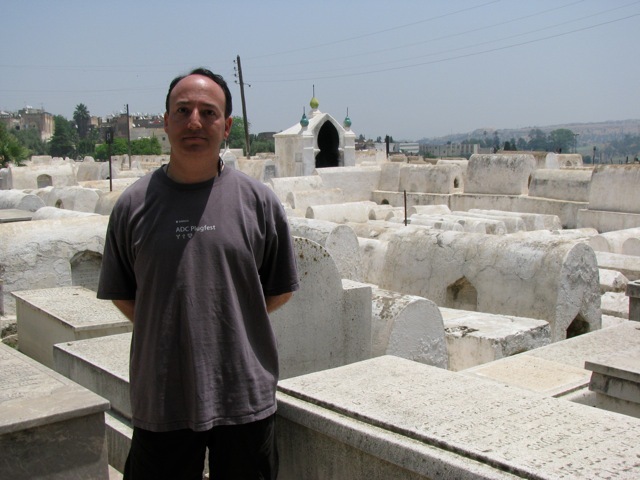 Next, we went to the “Mellah”, the old jewish section of Fes. 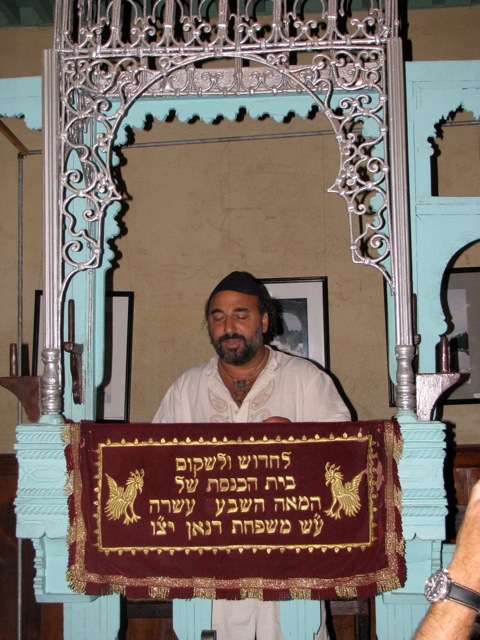 Here we toured the old Jewish cemetery, and an old synagogue. These were all interesting to see. For lunch, we went back to the same place we had gone on day 9, and it was as delicious as the previous day. After lunch a few of us separated from the group, and spent the afternoon shopping in the medina, for the first time without a guide. It was very liberating not having a guide tell us where to go and when. We all purchased a few items, doing the usual haggling about price that is the norm in Morocco. 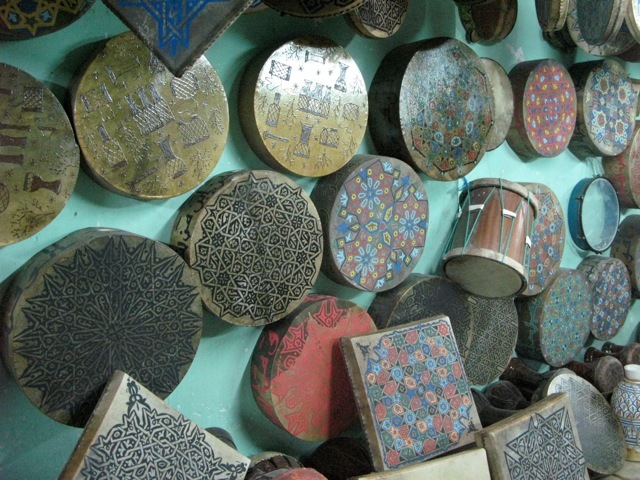 One of the places we went to was a drum factory, where I purchased a hand-painted Bandir (Moroccan frame-drum). 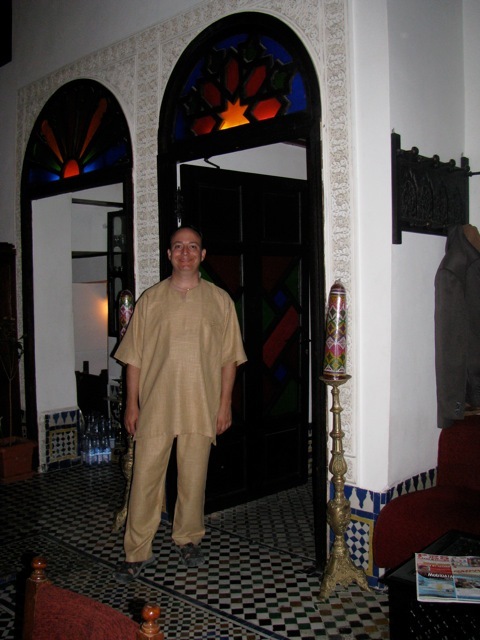 I also bought some traditional Moroccan clothing (which I ended up wearing to the end-of-tour party). We all managed to find our way out of the medina, even without a guide. Day 10 was the official last day of the tour, as some of the tour members were leaving the next morning (though others, such as myself, had paid for an extra day). 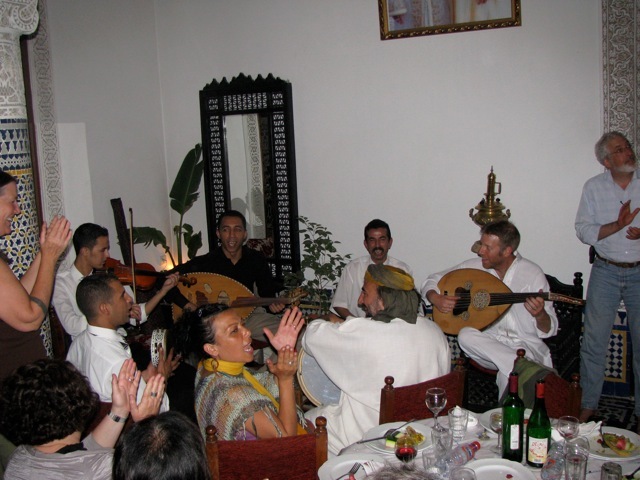 Since this was the last meal we were all going to be together in Morocco, we all met up at a restaurant in Fes for an “end-of-tour” party. 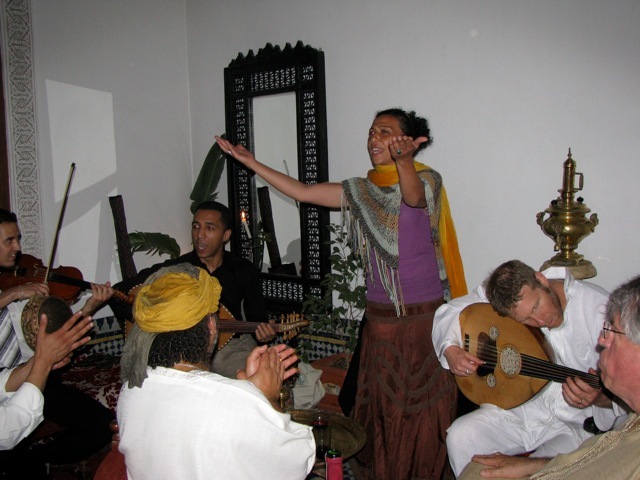 We had live music, couscous, and a chance to say our goodbyes to each other, and to thank our guides and support staff. This dinner was also the last time I saw Hamid, and I had a chance to thank him for the great tour experience he had provided for us. After dinner, we returned to the hotel, where we hung out, looking at the pictures, and reminiscing about all the fun we had had over the last couple weeks. We also said our final goodbyes to about a third of the tour members. All in all, a relaxing day, as our tour wound down. 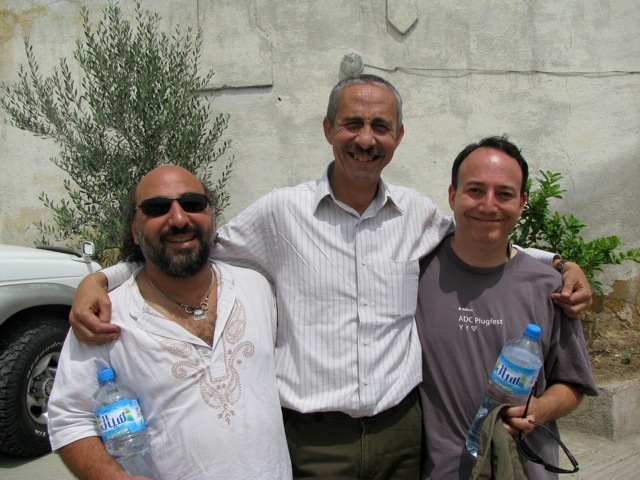 This entry was posted by andy on Tuesday, June 9th, 2009 at 12:51 am	and is filed under Preparation. You can follow any responses to this entry through the RSS 2.0 feed. You can leave a response, or trackback from your own site.